Montserrat Breezes is a beautifully appointed five bedroom, five and a half bath private Villa located high in the Woodlands section of Montserrat. Lovingly and carefully constructed by one of America's wealthiest families and updated by it's present owners, Montserrat Breezes boasts over 6000 square feet of indoor and outdoor living spaces, with breathtaking views (especially at Sunset) of the Caribbean Sea from virtually all living areas. Three king suites (all with king beds) feature spacious rooms with Plantation Shutters, en-suite baths and private verandas. Two lower suites include one king bedroom and an adjoining twin bedroom. Both of these bedrooms offer open ocean views, en-suite baths, and a shared covered veranda. The door between these bedrooms can be locked for privacy or opened for families with children. This villa was designed to maximize the ocean views from all rooms with large 'disappearing' glass and screen panels in each room. In addition, the open air dining and family rooms feature large Plantation Shutters on the rear wall, which open to view the private courtyard and manicured garden. The grounds are tiered with stone walls and are extensively landscaped with multiple varieties of palms, flowering trees and bushes. The lower grounds have bananas, lemons,guava,coconuts and grapefruit (when in season). Children will enjoy the variety of lizards, toads, and birds found on and around the property. Bring flashlights--the toads come out at night. Montserrat Breezes will easily accommodate an extended family, two small families or up to five couples. The lower full kitchen is perfect for poolside dining or entertaining. This villa is cooled by nearly constant trade winds and is situated across from an entrance to the famous Mountain Trails of Montserrat. It is ideal for hikers and nature enthusiasts. ***This villa is not suitable for toddlers or youths who cannot swim or would be inclined to push on the floor to ceiling screen panels. Renters assume full responsibility for pool safety. My wife and I have travelled extensively in the Caribbean. Montserrat represents the 'Old Caribbean'...unspoiled by commercialism and the friendliest people on Earth. We feel as though we have moved back in time when we visit. Great privacy, incredible ocean and Sunset views. No crime...laid back lifestyle. Montserrat Breezes is one of the largest villas on island with multiple indoor, covered and open outdoor sitting and lounging spaces, making it perfect for larger groups but is incredible for just one or two couples as well. The disappearing glass panel doors bring the outdoors into all living spaces. Behind Montserrat Breezes is one of Montserrat's famous hiking trails. All bedrooms, interior spaces, verandas, and pool have beautiful ocean and Sunset views. The grounds are tiered with stone walls and manicured with hundreds of palms and flowering tropical plants. Every living space steps out to a covered veranda. Large 20' by 30' tiled private pool with lounge chairs. Second full kitchen on lower level near the pool. 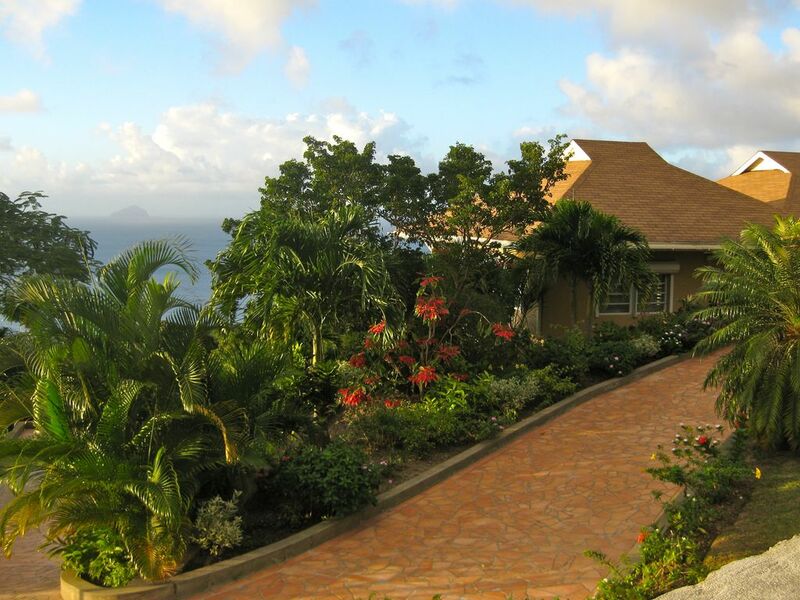 This Villa is located adjacent to an entrance to the famous hiking trails of Montserrat, yet has panoramic (Sunset)views of the Caribbean Sea.